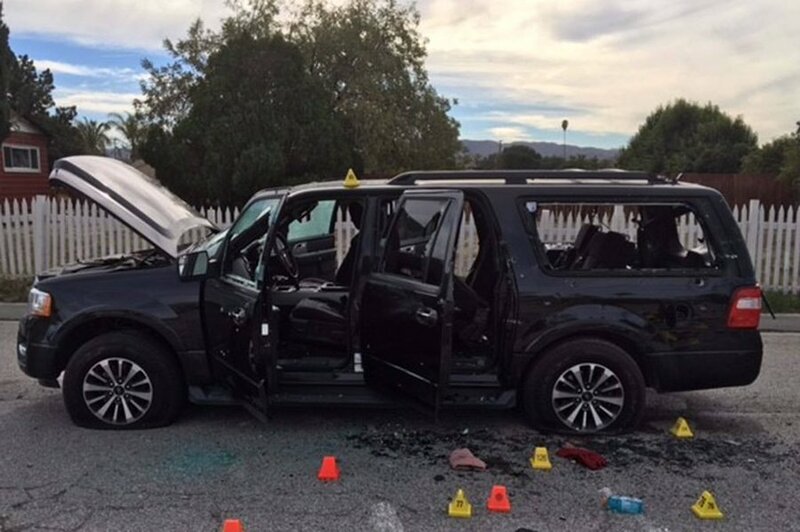 San Bernardino County Sheriff's office image of vehicle driven by Syed Farook and Tashfeen Malik on 12/2/2015. Use your browser to search for “The Stupid Party” and you will get over 90,000 results. The vast majority of the hits link the phrase “The Stupid Party” to the Republican Party in America. Many Americans don’t understand why this is the case. A traditional political party in America considered “stupid?" To bring clarification, we must understand the concept of a “Political-Religious Movement.” These are organizations that begin either as religious or political entities, but evolve into something more. A political party acquires a religious fervor, or a religion acquires territory and authority over the people within that territory. Either way, the resulting structure takes on increased power over what it would have were it simply a political or religious organization. Examples that come to mind are the Irish Republican Army and the Palestine Liberation Organization. They are identified by two central tenets of a Political-Religious Movement: They possess a unifying dedication to a particular ideal, and they manifest a consuming hatred toward a particular identity group. The Irish Republican Army had the ideal of an independent Ireland and a hatred for British people. The Palestine Liberation Organization has an ideal of restoring the Palestinian homeland and a hatred for Jewish people. At the trivial end of the spectrum is the “Soup Nazi.” Jerry Seinfeld created the character, and he brings entertainment value to the early stages of Political-Religious Movements. Most of us know a person who has a position within a group that uses his or her position to acquire extraordinary power. It might be the person in charge of a Girl Scout Cookie program or someone at a local PTA. These people enhance power by bringing a religious quality to their efforts. The program takes on a set of heightened ideals and the members of the opposing team or outside group become demonized. The central tenets of a Political-Religious Movement are there. At the other end of the spectrum is a world leader who acquires influence over millions of people. National Socialism in Germany during the 1930s began as a political party but evolved into a Political-Religious Movement with devastating consequences. The ideal of a perfect human race was matched with a hatred for the Jewish people, and millions of Jews in Europe were put to death. Political-Religious Movements dominate world cultures. We see them in the governments of Syria and North Korea. We see them in the drug cartels of Mexico. They are the driving force for street gangs in our major cities. They appear in cults of one form or another. But with Political-Religious Movements so common, why aren’t they recognized and studied? Why do we not see the terminology in our popular lexicon? One reason is that increased understanding removes the mystique from the underlying organizations. ISIS is one organization that benefits from this mystique. Imagine that we come to understand ISIS as a Political-Religious Movement. Suddenly the media attention associated with the “disenfranchisement” of Muslims becomes inappropriate. People no longer view ISIS as a type of religion. It certainly started as a religious organization, but when it achieved power and authority with the acquisition of territory and property in the Middle East, it evolved into a Political-Religious Movement. It maintains the Koran as its source of idealism, but its hatred of “nonbelievers” secures its status as a Political-Religious Movement. While National Socialism started as a political party, ISIS began as a religion. They each started at opposite ends of the spectrum, but are now emblematic of Political-Religious Movements. If we simply classify them as such, they take their place alongside the Pathet Lao, the Khmer Rouge, and the multitude of Political-Religious Movements throughout history. Political-Religious Movements focus our attention on one other significant issue. They abundantly display the attractor that is associated with Political-Religious Movements. That attraction comes from The Hate. We are drawn to it. This is the most interesting factor of all. The common idea is to associate those drawn to Political-Religious Movements as being from a minority, being disadvantaged, having a difficult childhood or having nowhere else to go. That is absolutely incorrect. It is simple human nature. Human beings are drawn to The Hate. It is a common feeling. We like to know that a particular identity group can be singled out for hate. Maybe it’s “The One Percent” or (as with those associated with Black Lives Matter) people in law enforcement. Maybe it’s the hierarchy of the Catholic Church! If we are taught to hate a particular identity group, it makes us feel good. It is “Othering.” We are not a part of that other group. We are a part of the accepted group. We like that. And that is why it is important to understand Political-Religious Movements: They exploit human nature. They increase their power and authority by appealing to our human instincts. I believe the human attraction to The Hate is linked to a Left-Brain / Right-Brain analysis. If your Left Brain is dominant, you tend to be more accepting, more amenable to ideas that are repeatedly taught to you. Right-Brain people tend to be more inquisitive and will look for outside validation rather than automatic acceptance. How does all of this relate to the title of this post? Here in America, we have our Democratic Party becoming more than a political party. It is working to fashion a sense of idealism around the notion that it is the political party that wants to bring an end to human suffering. The call to “End Suffering” takes on a religious quality – similar to a desire to perfect the human race. It becomes the touchstone of a new Political-Religious Movement: Our Democratic Party in America. But idealism is not enough. The Democratic Party fosters a hatred for Republicans. You know the characteristic refrain: Republicans are racist, homophobic bigots. Republicans want to destroy the environment, harm our children, turn the economy into a catastrophe, shred the Constitution, etc. The idea of being dedicated to end suffering, along with a visceral hatred for Republicans, has allowed the Democratic Party to evolve into a Political-Religious Movement in a very short period of time. What does the Republican Party do about this?